The Pier Arts Centre works in partnership with Orkney Islands Council Education staff, teachers and Arts Development team to raise awareness of the benefits of creativity and culture to school pupils. School visits to the gallery and workshops carried out in the classroom highlight the impact that a broader engagement with the visual arts can have on young people within the wider school curriculum and beyond. Activities are designed to support the Curriculum for Excellence and support core subjects such as literacy and numeracy in a creative and imaginative way. For those keen to delve further, a range of practical activity packs is available for teachers and pupils CLICK HERE. Working in collaboration with Orkney’s Itinerant art teachers, regular exhibitions of pupils’ art work are displayed in the gallery. The Centre also offers CPD opportunities for teachers. School groups are welcome to visit the gallery during our opening hours Tuesday- Saturday 10.30-5.00pm. Bookings should be made in advance by contacting the Centre. A range of self-directed activities are available and gallery staff will give a brief introduction and tour of the current exhibitions on display at no charge. The Pier Arts Centre is able to develop practical workshops to suit particular, skills and projects. Sessions based at the gallery and in the classroom can explore, through visual art, key, core subjects and introduce essential aspects of the Curriculum for Excellence. A charge is made for practical workshops based on individual requirements. The Pier Arts Centre has a long established relationship with the Art and Design Department at Orkney College UHI providing project briefs, professional expertise, mentoring and practical workshops for students studying at all levels. Many students participate in Piergroup projects and activities. 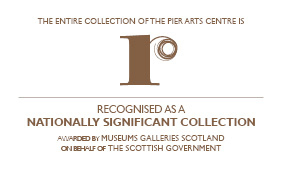 The Pier Arts Centre works in partnership with Higher Education Institutions in Orkney and beyond to make its Collection, exhibitions, activities and expertise available for academic research and to develop, support and contribute to research opportunities. The Centre’s resources and expertise are available for student use, for example, projects, dissertations and case studies and use of the Reference Library is encouraged for self-directed study by students at all levels of study. The results of research, where appropriate, are disseminate to a wider public through exhibition, events and publications. The Pier Arts Centre participates in a number of research networks including CORE and the Northern Peripheries network. The Centre is able to offer work experience and placements to young people in full-time education, either at school or in further and higher education. Placements can be as short as a week or up to several months. If you would like to know more about applying for work experience please contact - carol.dunbar@pierartscentre.com. From time to time, the Pier Arts Centre is able to offer bursary funded Internships and Graduate Placements. Recent opportunities have been funded through Creative Scotland, Museums Galleries Scotland, Talent Scotland and SCVO. Internships of this kind are always posted on the Pier Arts Centre website and advertised by the funding bodies through local and national and sector press.